So, nesting is a real thing I’ve discovered. The desire, no the overwhelming NEED for the closet to be organized is something you just can’t put into words. I do feel like a momma bird who is getting her nest ready for a special little birdie’s arrival. That includes making sure there is a place for everything, cleaning and then cleaning again, and making lists upon lists and lists of lists. Hospital bag packed? Check! Washed the clothes for baby to come home in? Check! Make sure the car seat is in? Check! This could go on and on (and it has). Chris even has his daddy bird nesting going on. 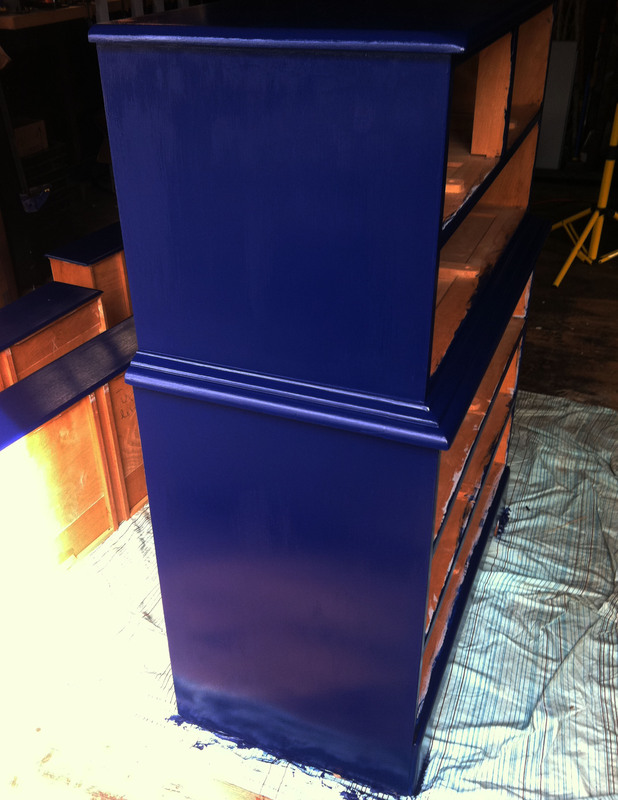 He’s been tirelessly putting coats of paint on the bureau for the baby’s room. He bought an erasable calendar for the fridge so that we would know exactly how the next weeks are scheduled. 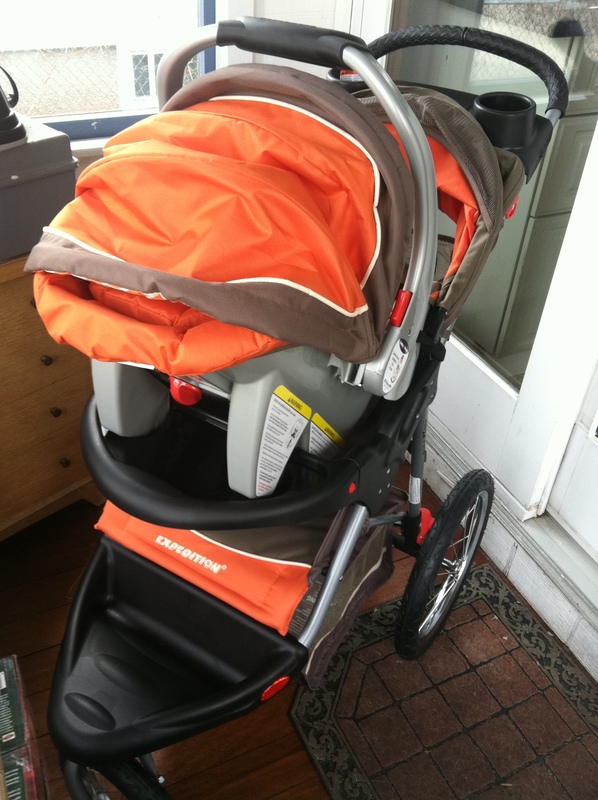 He put the stroller together (which apparently was no easy task). He even took it upon himself to take inventory a few weeks ago of what is in our pantry to see what needed to be used up. “I’m getting groceries for a week and it won’t cost more than $100.” OK. Hold up. $100? I’m a Whole Foods produce junkie and we are going to get groceries for $100 for a whole week and weekend? That includes coffee, organic lettuce, and earth friendly dish soap? What about my red grapefruit? What about the gallons of cranberry juice I drink? Hmmm. Well, using what we had combined with the list and menu Chris made up, we did it (well, he did it). I even got my grapefruit and my no sugar added mandarin orange snack cups. Can’t get enough of the citrus these days. The key is to make a list and stick to it. How often do you not make a list and then leave the grocery store with no real food? We ate so well that week! I made hummus and ate it on Triscuit crackers for lunches with soup. I ate cereal for breakfast (gotta get my iron, so I love my iron fortified shredded wheat) and fruit for snacks at work. We ate lasagna with homemade sauce that was previously frozen and pierogies (a fav from my childhood) one night and vegan pepper steak another. It was amazing and liberating to actually use the food in the fridge AND like our dinners. This past weekend, I decided to create dinner with what we had because it has practically become an obsession – how not to blow money on food we toss. I had nearly a full container of Arborio rice and some celery, half an onion, and string beans that needed to be used up as well as a random jar of roasted peppers. 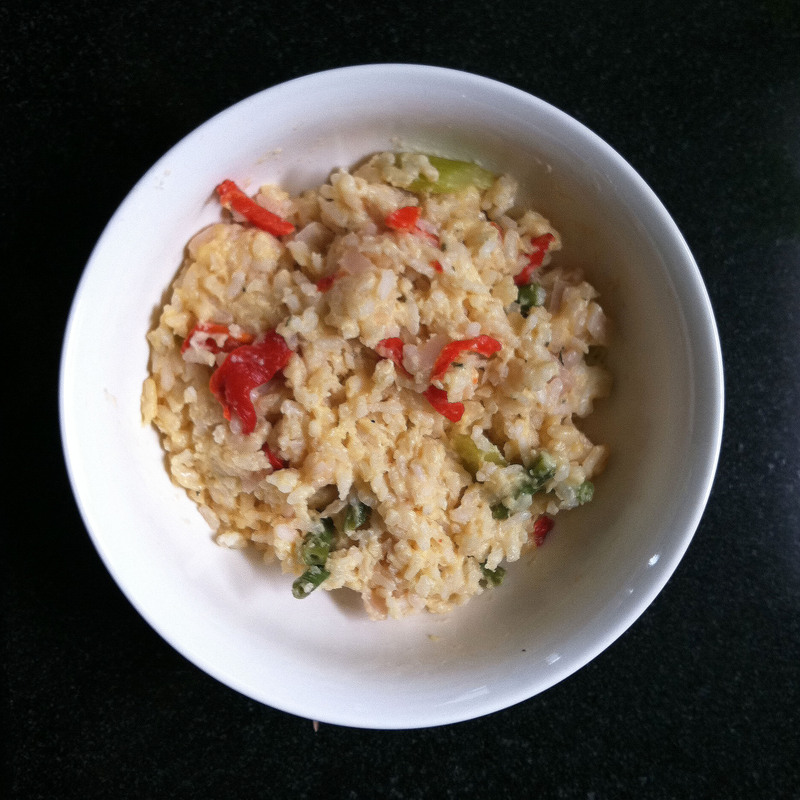 Voila – risotto that was so filling and so delicious. Here is how I made it, adapted from several risotto recipes I came across. It isn’t vegan because I added some Parmesan cheese and regular cream, but if I had So Delicious cream, I would have just as easily used that as well to skip the dairy. One other thing to note. Arborio rice has 9 grams of protein per cup (according to Livestrong), so you are indeed getting protein in this meal. If you want to add more, some faux chicken would be a great addition to add at the end, which is loaded with protein. Quorn makes yummy veggie chicken. In a large pot, sauté onion in the olive oil for a few minutes. ¼ cup at a time, add the warm broth white wine mixture and stir continuously. When the rice soaks up the liquid, add more liquid and keep stirring. The trick is to get the rice to soak liquid up slowly to avoid crunchy risotto. This process should take about 25 minutes. Add the spices (and feel free to experiment with your own…I was thinking that curry would be nice in this or nutmeg or even sage (not all together). Add the veggies in during the last 5-7 minutes. Keep stirring and adding liquid as needed to avoid the rice sticking to the bottom. You may not need all of the liquid but you may even end up needing some extra water. All rice is different. When the rice is soft and creamy, turn the heat off and let it sit for a few minutes. The very last step would be to add in the cream and Parmesan cheese and stir. If you are adding cooked veggie chicken, now is also the time. Please pardon my lame photos. I have not gotten back into the habit of using a real camera just yet. addition: here is a great link (blog: life as mom) that I discovered. She features recipes often and this particular week is meatless. Click here. I am wondering why none of these fantastic creations are making it over to your next door neighbor. Is there a chance before you go on hiatus for a while? You got it! I will bring in something yummy soon. I love craisins and wish I had used them! I have a giant “Costco” sized bag in my pantry. Good idea.